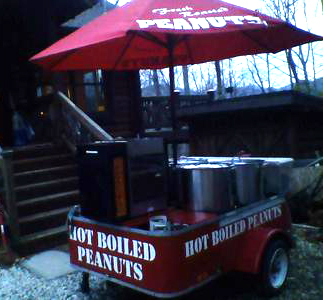 I am a boiled peanut Vendor in Glenville, North Carolina, on highway 107 at the Marina. I came up with the four stages of a Boiled Peanut Addiction, look and see where you're at. First Stage: Your friend gives you some of his boiled peanuts to try, you decide that "those were Good!" Second Stage: you see a Hot Boiled Peanut Sign while you are driving down the road, you slam on brakes, turn around and go back and get some. Third Stage: You Scour the net looking for the recipes on how to make your own Hot Boiled Peanuts. You find Boiled Peanut World. You make your own boiled peanuts. Fourth Stage: You get to where I am. You open your own Hot Boiled Peanut Stand on the side of the road. You have found a way to get everybody else to support you addiction! I guess the next stage is when you get your very own Peanut Farm. After all they are "JUST PEANUTS"
Don't think you're addicted yet? Come by my stand and I will help you get addicted. Don't like them at all, I have a Fresh Roasted Peanut Machine, just for you. Help! My boyfriend is at stage 3 and contemplating moving up to stage 4. Any suggestions? Circle K gas stations in Florida have them! Get in your car now! they sell cans of flavoring. Cajun Boiled Peanuts have been my addiction over 10 years now. But I never thought about selling them or making them myself! I'm so picky about the spicy flavor I get from the gas station on USAFB in Mississippi. They are my comfort food.